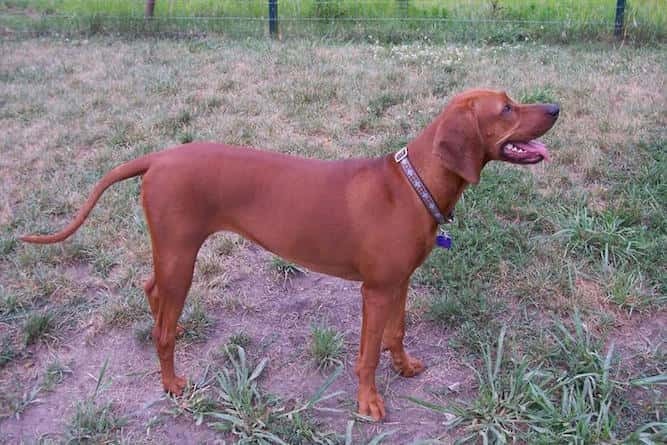 The Redbone Coonhound temperament makes him the perfect family dog. He loves his family, but he doesn't jump all over you to show it. He's very easygoing and happy-go-lucky. Put another way, if actor Owen Wilson was a dog, he'd be a Redbone Coonhound. Here are six “need-to-know” traits about the Redbone Coonhound temperament. These will help you better understand your Redbone's behavior. There are a few things that the Redbone Coonhound enjoys more than spending time with his loved ones. The Redbone is an even-tempered dog. He can be an energetic dog at times, so in order to calm him down, make sure he gets his exercise. You'll know you've run him to the end of his rope when he plops down at the end of the day for a snooze at your feet. For a hunting dog, the Redbone sure is friendly. In fact, he is perhaps the most excited of all the Coonhounds when it comes to making friends. Other Coonhounds include the Black and Tan Coonhound and the Bluetick Coonhound. Because he is so adaptable, he enjoys hunting as much as he does a day at the dog park with a bunch of other dogs. The Redbone is not a dog you should leave alone – unless, that is, you can give him enough toys to keep him busy. Even then, you should not leave him alone for long. His independent nature, coupled with his natural curiosity can work to make him destructive if he gets too bored. His independent streak can also get in the way of training him. As a hunter, he is always coming up with ways to outsmart prey – and he won't think twice about doing the same to you. As with any dog, baby Redbones are more energetic than older dogs. However, the Redbone is still a pretty high-energy breed. For the Redbone Coonhound, hunting can take up a whole day and he has the energy level and stamina necessary to do whatever it takes to catch his prey. When you consider the type of prey the Redbone is good at catching and helping hunters catch, it's no wonder he needs all that energy! Redbones have caught (and helped catch) everything from raccoons and possums to cougars and even bears! For you, this means he is very good at long hikes, jogs, or swims if you are into these activities. The Redbone gets along with everyone in the family, including kids and even cats (provided the cat doesn't give chase!). However, his energy level may be overwhelming for smaller children. He may bowl the child over if he gets the “zoomies” and runs about the house. You should still be hesitant about bringing a Redbone into your home, though, if you have smaller pets, like hamsters or lizards. The Redbone is great at making you laugh one moment by doing something goofy, and then cozying up for a snuggle with you the next. Peter Redbone of Tennessee, an early breeder of the Redbone Coonhound, is the dog's namesake. Breeders bred the Redbone Coonhound to be a hunting dog who is agile and unafraid of taking on animals larger than him. Wilson Rawls made the Redbone Coonhound a star in his popular novel, Where the Red Fern Grows, in 1961. Redbones are versatile dogs. They are also very loving and wish to please their masters, which makes them easier to train. As with all dogs, early socialization is the key to solving many potential problems. For instance, socialization reduces the Redbone Coonhound's barking at other people while on walks. You can start training a Redbone Coonhound as early as eight weeks old. It is for this reason that many people prefer to buy a dog from a breeder. When you adopt a dog, the dog is usually older, and it can be difficult to gauge what, if any, training he has already had. When you start fresh, it's like buying a new car. You have full control over the situation from the dog's early days. Wait too long – say, six months – and you will have to train a dog who is more stubborn and set in his ways. It is more likely that he will try to outsmart you, rather than listen to you. The Redbone does not require too much in the way of grooming. His short, smooth coat needs only minimal maintenance. A bath every four to six weeks is sufficient to keep his coat and skin clean. Use a grooming mitt weekly to prevent shedding. Check his ears weekly to remove any debris so as to prevent ear infections from developing. The Redbone's energy level makes him a great companion for outdoor activities, like biking and hiking. He needs regular exercise to stay happy and healthy. Because of his hunter instinct, though, never let him off of his leash. If he catches a whiff of potential prey, he will take off after it. Between 50 and 70 lbs. for a male. Females are slightly smaller, at between 45 and 70 lbs. And 21 and 26 inches for a female. You can expect your Redbone Coonhound lifespan to be between 11 and 12 years. There are no guarantees for how long your dog will live. But you as the parent CAN influence your dog's happiness and wellbeing You do so by making healthy choices and maintaining a watchful eye for the signs/symptoms of the helath issues above. Get a copy of The Ultimate Guide to Dog Health. Your Redbone will thank you and reward you with many years of fun, energy and vitality. So you've fallen in love with the Redbone Coonhound, and you want to add him to your family. That's great! You can find a Redbone Coonhound for sale either through a breeder or your local rescue or adoption organizations. The price of a Redbone Coonhound varies, depending on who you get him from. The average Redbone Coonhound price is around $600. This price may vary, depending on the breeder you choose. Some Redbone Coonhound puppies can cost as much as $800, which is still inexpensive when compared to other breeds. If you want to adopt a Redbone Coonhound puppy, check out the webpages of your local rescue organizations or adoption centers. If you're looking for a Redbone Coonhound, kennels may also be an option. If you are interested in a Redbone Coonhound mix, it is much easier to find one through a rescue or adoption agency. This is because breeders specialize in purebred dogs. If you decide to buy a puppy from a breeder, be sure the breeder is properly registered and licensed. Make sure you get copies of all of the dog's health clearances. And always run from a breeder who refuses to answer your questions, or who doesn't have an answer prepared. The breeder should be an expert on the breed, and s/he should know the dog you're considering buying inside and out. Conclusion: Why the Redbone Coonhound? The Redbone Coonhound temperament makes him an ideal family pet, even if he does have some of that leftover hunting streak in him. If you love to hunt – great! The Redbone will be eager to join you on long hikes or walks, and he will hunt game with the best of 'em. He's energetic, affectionate, and friendly, but he sure can be stubborn when his independent streak kicks in! The Redbone is a fairly healthy dog with few concerns, and his lifespan averages around 11 to 12 years. So many years to enjoy his company if you keep help keep him healthy.